Although Amasty is famous specifically for its B2C modules, the portfolio of the company includes some reliable B2B solutions as well. For instance, the Amasty Magento 2 Hide Price extension allows merchants to hide prices and Add to Cart button for particular customer groups. As a result, a store owner can implement a fully-featured B2B pricing policy. Also, you can motivate unregistered customers to create accounts. Below, we shed light on how the module looks and works from the perspective of both backend administrators and store visitors. Works on both category and product pages. Depending on your business goals, you may hide prices for all customers or particular customer groups. 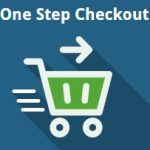 It is a widespread B2B practice, but you can easily use it on a retail website as an extra layer of motivation for store visitors to log in or create accounts. At the same time, prices can be still displayed, but you can hide the “Add to Cart” button. It also adds the same layer of motivation. If you don’t want to hide the “Add to Cart” button, the Magento 2 hide price extension by Amasty allows you to replace it with a custom one. 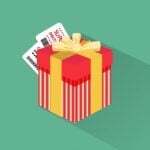 You can also add unique text that provides customers with the understanding what else is necessary to do to purchase a product. It helps to get additional information about a customer, as well as find out order requirements. After a visitor clicks on the custom “Add to Cart” button, a popup with additional requirements is displayed. As a result, store admins collect customers’ data without any extra efforts. Besides, it is a new way to contact each customer directly, generating a rich client database. Also, it is possible to link custom buttons to specific store pages with this Magento 2 hide price extension. The most obvious way to use this feature is to redirect visitors to the registration page. For example, you could also rename the “Add to Cart” button to “Register to Get the Price”. If you have any special conditions that shoppers must know before placing an order, redirect them to the “Learn more” page. Also, you could link the button to the contact form page (if there is one on your Magento 2 website). As mentioned above, you can fully leverage the support for customer groups, turning the Amasty Hide Price Magento 2 module into a robust B2B tool. With this functionality, you can generate special offers for wholesalers and retailers and hide prices from unregistered customers or competitors. Quote requests is another vital feature provided by the Amasty Magento 2 Hide Price module. Each time a request for product price is placed, your admins will be notified. As a result, the response time will be reduced as much as possible. Details of each request are available on a separate page, and it is possible to send a reply right from there! 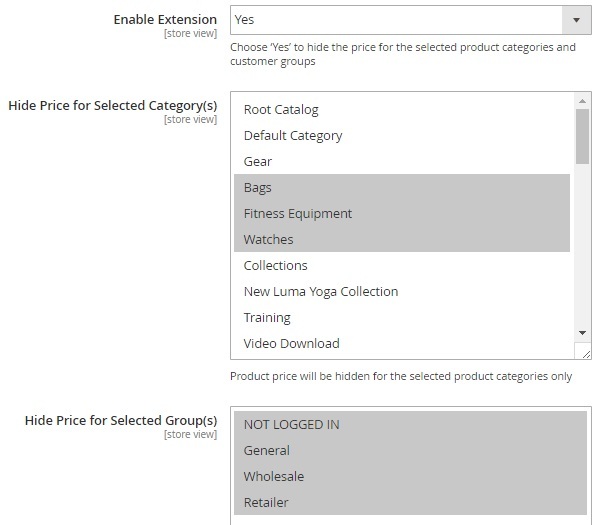 To configure the Amasty Hide Price Magento 2 module, visit Stores -> Settings -> Configuration -> Amasty Extensions -> Hide Price. 7 tabs of settings are available here: General Settings, Hide Price Options, Frontend Options, Admin Email Notifications, Auto Reply Email Options, GDPR Consent, and Developer Options. Under General Settings, you can enable/disable the module and choose categories and customer groups for which you need to hide prices. Besides, the Magento 2 hide price extension allows specifying exceptions (type product IDs and customer IDs to cancel restrictions). Next, choose email sender and template for the Admin Reply email. 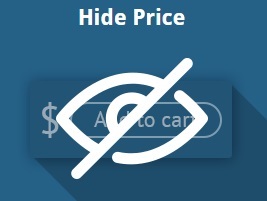 In Hide Price Options, decide whether to hide prices and add to cart, wishlist, and compare buttons. In Frontend Options of the Magento 2 hide price extension, specify the hide price text. Usually, it is something like “Contact Us”. Next, add custom CSS for the Hide Price link. You can also upload an image and replace a price with it. The last option here is “Link Url”. 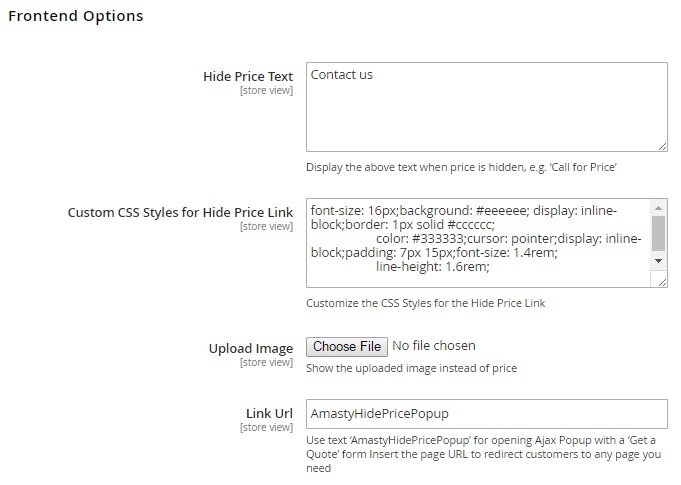 You can use “AmastyHidePricePopup” to activate an AJAX popup with the “Get a Quote” form. Alternatively, it is possible to insert a page URL to redirect customers there. 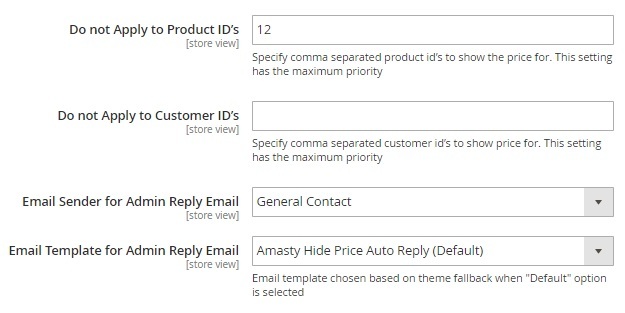 In Admin Email Notifications of the Magento 2 hide price module, choose admins to whom to send the email, specify an email sender, and select email template. In Auto Reply Email Options, enable the feature, select a sender, and choose an email template for the automated reply. In GDPR Consent, you can enable the appropriate feature and enter the text for the consent approval visible on the frontend. Developer Options of the Magento 2 hide price extension must be configured if you are using a custom Magento 2 theme. All quote requests are available under Marketing -> Hide Price -> Get a Quote Request. The request grid contains a request ID, customer name, email, and phone, product ID, customer comment, store view, date and time of creation, and status (Pending, Viewed, or Answered). The same information is available on a request view page of the Magento 2 hide price extension, but there is also a form for an instant reply, so your admins can react to new requests within seconds. 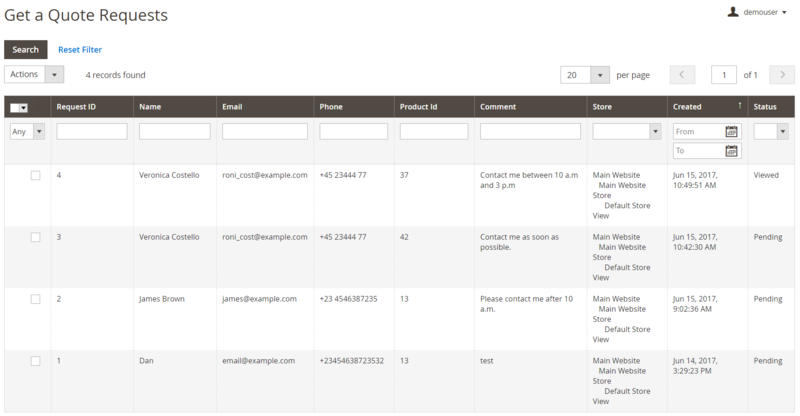 Click the “Contact us” button, and you will see a quote request form, where a customer can leave his or her contact details and comments related to the product. 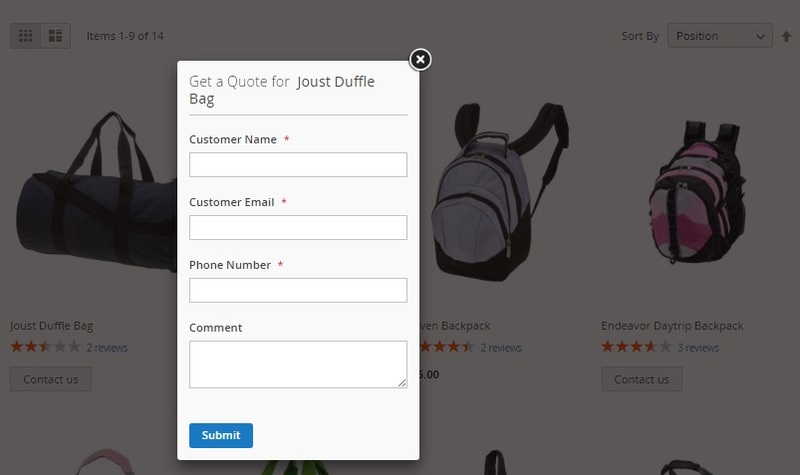 Now it is possible to replace the “Add to Cart” button in the “Request a Quote” popup. Now the module is compliant with the latest EU GDPR requirements. Compatibility with Amasty Quick View was implemented. Ability to select an empty value of a category ID or a customer group ID in the extension settings was added.